I knew that this wallpaper was from you when I saw the thumbnail because of its lightness/brightness. Firstly, I would like to say your vectoring is very nice and smooth. The only problem I can see here is that it is too bright. Like there is no proper lighting. It's like they are in an open air state when in fact they are in a room. I think the main problem for having it like that is you started with a very light base color. Most of your walls are like that,and I think it needs improvement. What I can suggest is that you start with a darker shade/normal shade for the base color and after doing everything, that's the time you adjust your lighting. It doesn't matter if your character looks detached from your BG at first because you'll do the blending in the end. 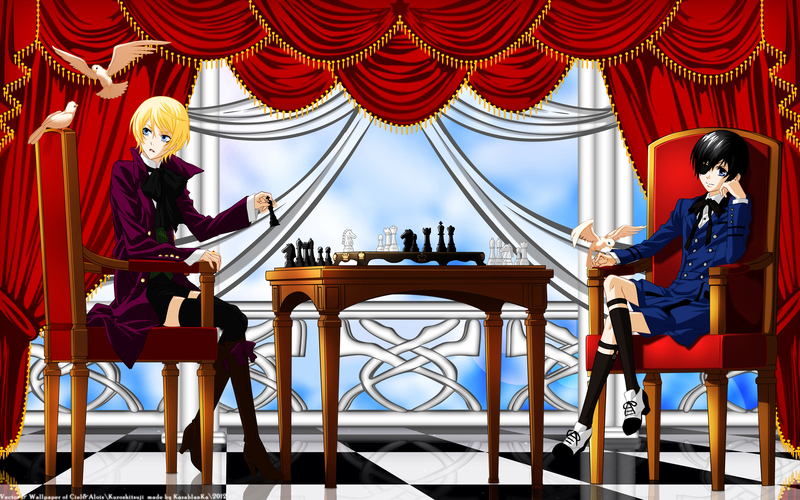 But I'd like to point out one technical mistake, the chess piece Alois is holding in his hand is the worng color, cause the white king is missing from the board + if there is already one black king on the chess board, how can he have another one in his hand? This is a very skillfully worked piece and the subject matter of particular interest, capturing a fleeting moment in time. 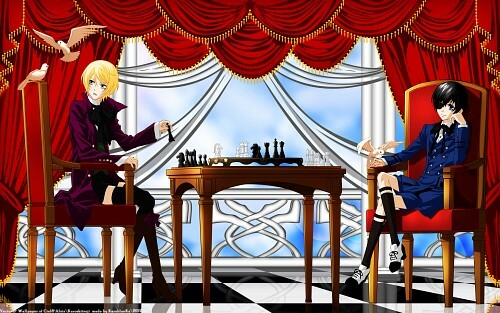 I can just imagine Ciel's vocalization "Checkmate" a mere instants before the dove took flight before him.